Discussion about politics and individual choices in cleaning up Utah's air. Wood stoves, water heaters and other home sources already eclipse industrial pollution in Utah and are expected to comprise even more overall winter pollution as our population doubles in the next few decades. 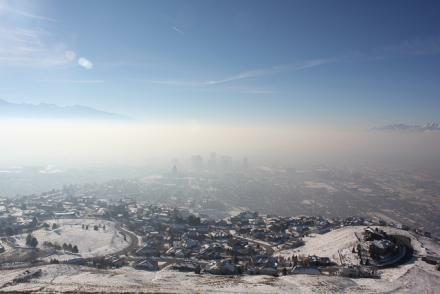 These area sources of pollution are increasing our dirty winter air, which is in turn increasing health risks for Utahns, from pneumonia to allergies to pregnancy difficulties. KUER’s new solutions-based open forum series, KUER Conversations, will begin with a panel discussion on Utah’s Air Quality, called Pollution Gets Personal, with moderator Judy Fahys. The panelists will represent various fields of expertise and points of view at the forum, but the audience will be encouraged to pose questions and ultimately drive the discussion. At the heart of the conversation, we hope to explore the delicate balance between personal responsibility and personal freedom in solving our pollution problem. Join the conversation and learn what you can do to help Utah’s air quality at the free event on Thursday, January 14, 2016 at the City Library at 7:00 pm. The event will be streamed live through The University of Utah's Periscope account. Download the Periscope app and tune into @UUtah's stream around 7pm on January 14th to watch the event live, or visit @UUtah on Twitter on January 14th at 7pm to access the live stream via a direct link. "Pollution Gets Personal" is part of KUER's new solutions-based open forum series called KUER Conversations.